Unfortunately, some studies of Jonah get tangled up in questions of historicity to the degree that the heart of the story—the expansive depth of God’s patience and mercy—can be missed. While some read Jonah as a historical narrative, there are a number of reasons for thinking that this is a misunderstanding of Jonah’s genre. Regardless of one’s position on the historicity of Jonah, though, most readers can hopefully agree that the main focus of the story is on the nature of God’s forgiveness and mercy. I’m intrigued by Cary’s argument, especially since this approach sheds potential light on how the book of Jonah may have addressed the communal concerns of its original readers and hearers. 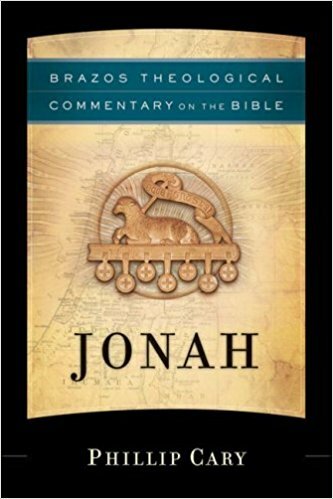 However, it’s an interpretive angle that I haven’t come across very often before—at least in relation to Jonah—so I (and possibly other readers) would have benefited from more extended engagement with the Jewish and Christian history of interpretation in order to place this reading in wider context. At various places throughout the commentary, Cary brings up the surprisingly humorous and ironic nature of Jonah. Structurally, the book is divided into two main halves, and he observes that in both of them, “Jonah is a blessing to the Gentiles despite himself” (p.17). In 4:2, Jonah quotes Israel’s fundamental conviction that God is gracious and merciful, but he brings it up, not in praise, but as a complaint regarding what elsewhere is cherished as a beloved confession of Israel. Another ironic feature of Jonah’s story worth bringing up is the ambiguity of the final word in the Jonah’s declaration, “Forty days more, and Nineveh shall be overthrown!” (3:4, NRSV). Roughly speaking, it means to overthrow or overturn, but Cary tells readers, “To overturn can mean not only to overthrow and destroy but also to turn over, turn around… [and] The turning can be for bettor or for worse” (p.109). Looking back in light of how the story turned out, it may be that God ironically gave Jonah more hopeful news than the prophet ever realized. Cary’s treatment of God’s extended conversation with Jonah in chapter 4 is another thing that makes his commentary notable. At one level, the significance of this episode in the narrative seems fairly obvious. Jonah is angry about God’s mercy toward the people of Nineveh, and God calls Jonah out on the absurdity of having deeper pity for a plant than a sprawling city filled with people. True as that reading is, Cary interprets this final section as being primarily concerned with the situation facing the Judeans returning from exile. Of course, this interpretive strategy is in line with his general approach to the figure of Jonah. Exploring Jonah alongside Cary means discovering that, when read in canonical context, Jonah’s mercy for the gourd turned out to be more closely connected to God’s mercy for the Gentiles than Jonah, or anyone else, could have ever guessed. Cary’s commentary is a thought-provoking and happily interesting volume in the Brazos Theological Commentary on the Bible series. He brings the story of Jonah to life and gives readers much to contemplate as they work their way through it. Though he makes use of historical-critical scholarship, he also addresses the more existential and theological questions raised by the text. Cary’s commentary also gives readers a fruitful example of what it looks like to read Scripture with a developed biblical and theological imagination. Lastly, his work gives evidence that those who consider Jonah to be an extended parable still have a deep and abiding love for Scripture. While I have some reservations about Cary’s rather allegorical interpretive tendencies, I’m intrigued by them, and his Israelogical reading is quite interesting. In the end, this is the second volume in this commentary series that I’ve read (the other one was on Colossians), and both have given me illuminating conversation partners in the reading of Scripture. My appreciation for them continues to grow, and I think it’s safe to say that Cary’s commentary on Jonah won’t be the last one I enjoy. This entry was posted in Book Reviews and tagged Book Reviews, Figural Interpretation, Interpretation, Jonah, Old Testament, Phillip Cary by joecrow91. Bookmark the permalink.